Length: 4mm. Background colour: July-April, buff/beige; April-June, reddish. Pattern colour: black spots. Number of spots: 15-21 (19). Spot fusions: sometimes. Melanic (black) forms: no. 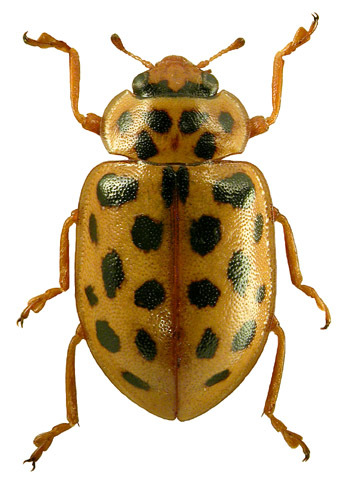 Pronotum: buff/beige or red with 6 black spots; rounded at the sides with greatest width in the middle. Leg colour: pale brown. Other features: distinctly elongate and flattened in shape. Fourth-instar larva: thoracic region cream/white with dark patches; abdomen pale grey with alternating rows of black and white tubercles running longitudinally; fine hairs projecting from tubercles. Pupa: unknown. Habitats: Water ladybirds are habitat specialists, occupying reed-beds and grassland in marshy or wet locations. This species can often be found on the emergent vegetation surrounding ponds. There are a few records from exposed riverine sediments. Host plants: Water ladybirds can be found on tall emergent plants including reeds, reedmace, reed sweet-grass and rushes. 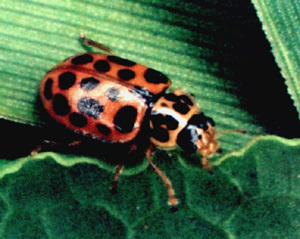 Overwintering sites: Water ladybirds overwinter between leaves and in stems of reeds, and in grass tussocks.